Pay the $189.00 class fee in full. Pay a deposit of 0.00 to secure a spot in this class. Since we've started programming in Atlanta we've been making strong new connections with fantastic Atlanta-based educators and casting directors. BRIAN BEEGLE from Stilwell Casting has joined us for our first two ATLANTA CONNECTION programs and we are thrilled to announce that he will be joining us up in the big Apple to teach an intensive just for NY-based students! Brian will help you unleash your creative thinking in a work session style that will make you laugh, challenge your preconceived notions of commercials and remind you to tap into your joy as an artist. 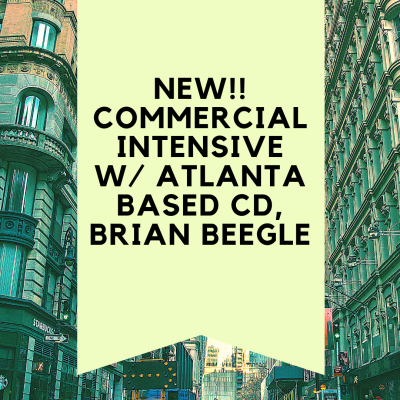 Unless you are planning to get to Atlanta soon-- you can't miss this great opportunity to work with Brian in your own backyard. Actors must prepare short commercial copy for this event. Brian Beegle has served as Casting Director for 8 years with Stilwell Casting which is in its 35th year of business. Brian spent his childhood and early adulthood as an actor and now, having cast over 500 projects, Brian's strength is not just knowing and directing the talent pool, but also understanding and honoring each project’s tone and the director’s vision. PLEASE NOTE THIS SESSION TAKES PLACE IN OUR NY STUDIOS!